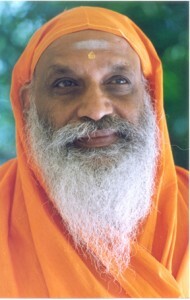 Pujya Swamiji is a distinguished, traditional teacher of Vedanta. His depth of understanding and nuanced appreciation of both Eastern and Western cultures make him that rare teacher who can communicate the vision of non-duality to modern listeners. He is able to make one see, with immediacy, the truth of oneself as the whole. An eminent teacher of Vedanta and an erudite scholar in Sanskrit, Swamiji is well known for his excellent communication skills. Swamiji has been teaching Vedanta in India for more than four decades, and around the world since 1976. In his public talks abroad, Swamiji has spoken at many of the most prestigious American universities, and has addressed international conventions, UNESCO and the United Nations, where he participated in the Millennium Peace Summit. A teacher of teachers, Swamiji designed and taught six resident in-depth Vedanta courses, each spanning 30 to 36 months and three more have been conducted with his guidance. The graduates from these courses are now acharyas, teaching around the world. More than one hundred are now Swamis and are highly respected as scholars and teachers throughout India and abroad. Some of these Swamis and Swaminis have conducted their own long-term residential courses under the guidance and assistance of Swamiji. One was here in 2002 at the Gurukulam in Coimbatore. Also under Swamiji guidance, numerous centers for Vedic teaching have been founded around the world. The Ashrams founded by Swamiji in India are the Arsha Vidya Pitham in Rishikesh, the Arsha Vidya Gurukulam at Coimbatore and the Arsha Vijnana Gurukulam at Nagpur. In the U.S., the main center is the Arsha Vidya Gurukulam at Saylorsburg, Pennsylvania. At present his students have set up many centers in India and abroad that carry on the tradition of Vedantic teaching. After teaching Vedanta for over four decades Swamiji now fears the erosion of the person living a life of dharma (dharmi), integral for protecting sanatana dharma, due to onslaught from various sources. The All India Movement (AIM) for Seva, inaugurated in November, 2000, brings medical, educational, nutritional and infrastructure assistance to villagers in the remote areas of India. This movement enjoys the blessing of all traditional Hindu spiritual leaders who have united as a single body, the Acarya Sabha, through the coordinating efforts of Swamiji. In November 2001, Swamiji convened the first World Congress for the Preservation of Religious Diversity in Delhi, inaugurated by the Dalai Lama and the then Prime Minister Mr. A.B. Vajpayee. An important outcome of the Congress is the formation of a Global Commission for the Preservation of Religious Diversity, spearheaded by Swamiji. Swamiji was also active in forming and participating in the Womens Global Peace Initiative, which convened at the United Nations in Geneva in October 2002. Enlightening the world, one helpful aritlce at a time.